Mom of Many Words: Can great minds who think alike survive collaboration? Can great minds who think alike survive collaboration? I recently heard comedy writer Alan Zweibel describe how the theme song to “It’s Garry Shandling’s Show” was conceived. Zweibel, whose audience at the Erma Bombeck Writers’ Workshop was eager to soak up the actor’s comedic aura, recounted the elevator ride where he and Shandling started and finished the iconic ditty. In a recent tribute to his writing partner published in Variety, Zweibel wrote about their introduction through his manager when he was recruited as a consultant for Shandling’s Showtime special. The meeting and subsequent joint project sealed the deal for future collaboration. At the beginning of his writing career in the 1970s, Zweibel earned seven dollars for every joke he handed over to comedians seeking fame in the Catskill Mountains summer resorts famous for doling out promising new acts at that time. Eventually he approached producer Lorne Michaels armed with a compilation of over 1,100 jokes he had written. Michaels hired him as one of the original writers for Saturday Night Live. On his first day at SNL, the shy and anxious Zweibel hid behind a plant in the writers’ room - until Gilda Radner spotted him. In spite of their odd introduction, the pair formed an exceptional collaboration that developed into an enduring friendship. Zweibel’s message to workshop attendees was that even the most adept writers can hone their craft to a sharper point with collaboration. His comedic mergings forged a path into television, film, theater and publishing. 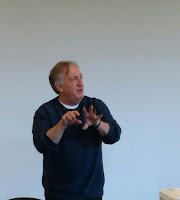 Zweibel emphasized that working with a writer who can complement your style might mean the difference between finding the right audience and missing the boat, especially now when writing teams are heavily endorsed. But the story we didn’t hear that April morning in a University of Dayton classroom was one of contention between Zweibel and Shandling that resulted in a battered friendship and long periods of zero communication. For two such comically brilliant minds, wading through the process of coagulating each other’s ideas had to be both exhilarating and exhausting. Who said it funnier? Who was more willing to shelve their idea for the sake of the show? Where was the shift from an invincible partnership to a heated parting of the ways? As a writer with a miniscule portion of experience compared to these two veterans, my exposure to collaboration has been limited. As an amateur songwriter, by my late twenties I had accumulated years of lyrics but had little sense of original melody. There was an awkward attempt to join up with another songwriter who had answered a classified ad, declaring that my weakness was his strength and vice versa. On our first meeting he wanted me to sit quietly next to my upright piano while he plunked out every tune he had ever penned in the course of an afternoon. At our second session I worked some lyrics into a couple of his tunes, but he was averse to any melodic changes. He left that day with a few strings of my words and I never heard from him again. I neglected to keep a record of what I wrote and to this day have no idea if my lyrics contributed to the final rendition of a decent song or to a recycling bin. I often battle my lone wolf tendencies when it comes to surrendering an idea, but Zweibel makes a good case with his advice for writers to get out of their comfort zone in order to progress in the business. For a collaborative effort to work you must be willing to let your guard down and trust that your cohort wants to make both of you look good. Zweibel and Shandling did it well. Ironically, the same marriage of like minds that had propelled a half hour sitcom into television fame would eventually lead to resentment and acute damage to their personal relationship. It was fortunate that, following years of silence, the two had resurrected their friendship and were able to share in the glory days of “It’s Garry Shandling’s Show” at the San Francisco Comedy Festival in 2011. A few days after my return home from the writers’ workshop I looked up – of all things – the show’s theme, which had been repeatedly circling like a vulture in my head at three in the morning. I came across the article spelling out Zweibel’s regret over time lost with Shandling, and I plainly recalled the writer’s worn expression of sadness when he spoke a week earlier. It struck me that Alan Zweibel wasn’t mourning the loss of writing with his friend. He was mourning the loss of simply being with his friend. Despite the creative tug of war a writing partnership may have to endure initially, when it’s right the personal and professional rewards can be far greater than going it alone. As far as successful collaborations go, the combined writing genius of Zweibel and Shandling was the reason I found myself awake at three in the morning cursing the theme song stuck in my head and giving its creators the last laugh. Thanks for a thoughtful piece, Janine. I didn't know the rest of the story - only what Alan discussed in the session I attended. I was disappointed that the show isn't available on Netflix. I've never seen it! BTW, I just finished reading Candace Bergen's new book and reflecting on the collaboration behind "Murphy Brown." Smart comedy is a joy to behold! Janine I loved this essay. I think there is a fine line between between sharing and surrendering. As writers we are making a baby with words that is ours to nurture and grow as we see fit. We don't like anybody telling use how to raise our kids! But I think you are spot on about collaboration. Once an editor gave me so many notes that I ignored them all and still wrote a brilliant piece. When she commented that she loved the piece but it didn't contain her edits I said, "I know. That's because there were so many notes that it gave me a headache." God works in mysterious ways.